In ‘La Nostra Costa’ (P.131) I write: “Onward we would go , another six miles (from the Pigeon Point Lighthouse) to Pescadero Creek Road. Bronco (my father) would make a right-hand turn onto this Road, and the Old Carrettone chugged along for another two miles, passing green field of artichokes and brussel sprouts and finally arriving at the little town of Pescadero”. I wasn’t aware that the area was called “Arroyo de Los Frijoles”. Thanks for the info. BTW: My Godfather Tony Micossi and his family ran the “Elkhorn Bar and Restaurant which was located where the US Post Office is now located. 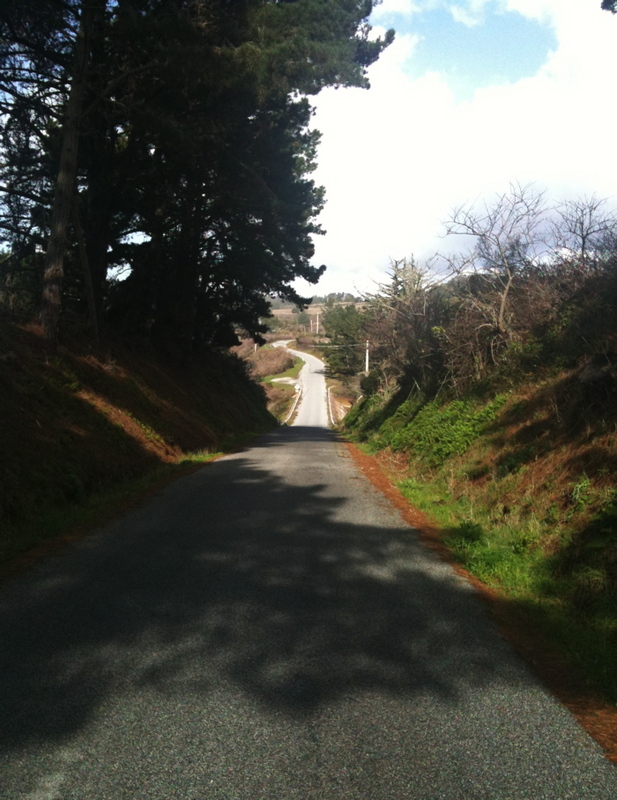 Okay, I’ve taken that road into and out of Pescadero. No wonder it looks familiar. It’s been a while. Have to do it again on my next coastal trip north. I would have taken an “S” or “T” but all the back country roads started with either a “G” or a “J” – county road designations. It was fun — long, but fun. This is the original Coast Road into or out of Pescadero. This road passes behind Bean Hollow which is north of Pigeon Point Lighthouse, north of Año Nuevo, north of Waddell, north of Santa Cruz. Kinda like how you guys have an original Coast Road running behind the bridge and Molera, except this one is asphalt-paved. And where exactly is this? Looks familiar, but then I’ve traveled many of the backroads, on and off the coast. I once set myself the goal of traveling from Big Sur to Medford, OR ONLY on roads that began with G or J. (I went over N-F Rd to Jolon, first.) Finally, an hour or two from the OR border, the only choice left was 5. Arrghh!